We aren’t entirely sure if the Alagna pant (pronounced uh-LAHN-ya) is supposed to be the ideal training pant for racers, the snug pant for backcountry skiers, or the “quiver of one” pant for light ‘n fast skiers. What we do know is that it’s awesome and that if you like to move quickly in the mountains, you’ll like the Alagna. Thanks to Karpos’ highly breathable and stretchy Thermodrytex Double and Thermodrytex PL+, you can wear the same pants to ski ballet class as you do setting speed records on local peaks. A DWR (durable water repellent) coating is employed from top to bottom to keep the pants clean, breathable, and weather-resistant without sacrificing breathability. The knee panels are articulated for maximum range of motion and are finished internally with thermofleece. This means a smooth, friction-free surface for your knees, even on a warm spring day. One large zippered pocket on the back holds a secret or two. Boot buckles are accessed by way of a YKK zipper in the cuff with an internal gusset that keeps everything nice and tidy. Once you try Karpos, you never go back. Elastic waistband is comfortable for hours on end. Zippered pocket on the back of the waistband is big enough to hold a phone, keys, or nutrition. Elastic cuff keeps the pants in place during an ambitious booter or lengthy approach. Reinforced cuff panels protect against ski edges, crampons, and help keep the weather out. Thermodrytex Double, Thermodrytex PL+, and Thermo Fleece are cutting-edge fabrics with the light ‘n fast approach in mind. Hey Curly, I think we have pretty similar measurements and I just finished trying these pants. As this pant designed to be a very stretchy, tight “training pant”, each size can cover quite a range. With that being said, I think the small or medium would better for you depending on if you wanted “compression”(small) or “snug”(medium). Hope that helps! 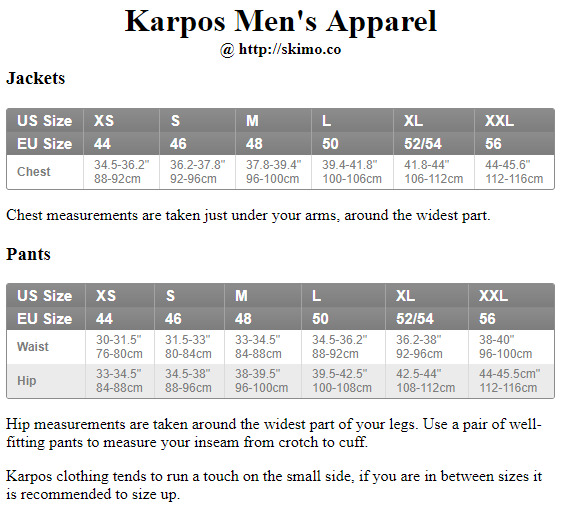 Can anybody comment on Karpos pants sizing relative to Dynafit/Crazy Idea? I'm a Large for Dynafit, XL for Crazy Idea. Thanks! Hi TSB, I'm the same sizes in Dynafit and Crazy Idea as you, and I tend to be an XL in Karpos. I hope that helps!